CCTV images showing burglars pulling off the "audacious" Hatton Garden jewellery heist have been released. The images show three men outside Hatton Garden Safe Deposit Ltd in central London, Scotland Yard said. Contents of 72 safety deposit boxes were taken from the firm in wheelie bins and bags during the raid. On Friday it emerged the Met received a call on Good Friday and were told an intruder alarm had gone off - but decided it did not require a response. Officers are now investigating why the call was given a grade that meant no police response was deemed necessary. Previously, Scotland Yard had said it was alerted to the burglary on Tuesday. Det Ch Insp Paul Johnson said the images showed the men using a side door situated in Greville Street to make their way to and from the premises. "They were highly audacious, entering on two occasions over that weekend," he said. He said the footage "along with other material" was being evaluated to establish the precise movements of the suspects and the "painstaking" investigation would continue into next week. "I would appeal to neighbouring businesses, or members of the public who are either witnesses or in possession of CCTV footage, to contact us with information to support this inquiry," he said. The full CCTV video, obtained by the Mirror, shows the men make two visits to the vault between Good Friday and Easter Sunday. 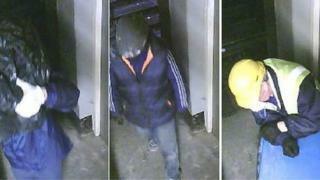 In the CCTV footage, one man outside the safe deposit building is seen pushing a wheelie bin, which the paper said could have contained the large drill used for breaking a hole through the lift shaft. The newspaper, which published the 17-minute video on its website, said the men made a getaway in a white van. It said the van was seen pulling up shortly before 07:00 on Easter Sunday. A source was quoted as saying the raid was the work of a professional gang who "planned this job down to every last detail". The Met Police said it had already recovered the footage "at the earliest opportunity", but declined to comment on why it was only released after being published by the newspaper. Officers are still waiting to carry out a face-to-face interview with the owner of the safety deposit company because he is overseas, but have spoken to security staff working at the building. It has said items were stolen from at least 56 safety deposit boxes and police have so far contacted 42 holders. In total, 72 boxes were opened out of the 999 installed there. Five were vacant and 11 were due to be opened by the company following the non-payment of fees, police said. A heavy duty drill was used to bore holes into the 6ft (1.82m) thick reinforced concrete walls to access the vault after the thieves had climbed down a lift shaft. Experts said it was likely the thieves made several holes until they had created a big enough space to get through, which would have taken an experienced operator several hours. Hatton Garden is famous for jewellery and the vault was used mainly by local jewellers and gold dealers.